Captain Faruqui sat in silent meditation behind his ready -room desk staring at the model at the far wall. His first command, a tired Excelsior class ship, long and elegant with narrow nacelles perfectly suited to extended periods at high warp and visually stunning in her prime representing the definitive pinnacle of starship design. His ship, the U.S.S Malinche had served him well while he forced his career towards Starfleet intelligence, always a thing that held the greatest fascination for him. He smiled faintly as he thought of more innocent times when his ship had enjoyed a more subdued routine than the constant crushing stress he now lived with. 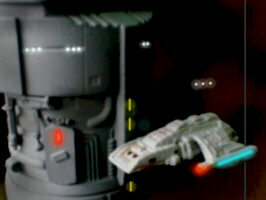 The Violator was under cloak in hostile space while his entire security force was looting the computer systems from a secret base and a Scarab class ship was hunting him down with potentially more on the way or indeed already there. His door chime sounded indicating the presence of someone without wishing to be within. He sighed heavily to himself. Certainly his tenure aboard the Malinche had been a mere stepping-stone in his career but he was forced to admit that he regretted leaving sometimes and to wonder if he would ever think of the Violator in such fond terms. "Enter." He called out, sitting up straight and switching his desk console on to make it appear that he was as busy as he liked his crew to think that he always was. Commander Brown stepped in with a spring in her step that could only indicate the arrival of some good news. "You have something for me?" He asked, gesturing with his open palm for her to take a seat. "I have news, and I have good news." She replied with a curt nod. "I’m waiting…" He told her with a hint of amusement. "Blake Girling somehow got down to the asteroid." She began with a slightly lowered head and a shrug of her eyebrows. "I see." The captain nodded with little surprise. "It seems that Ensign Katherine Rogers codes were used to fake his boarding orders and he stunned the guard with a device made from parts of the replicator." She explained, her eyes fixed on her pad. "The computer didn’t detect the missing parts because he damaged the diagnosis circuits." "And the good news." He prompted, unmoved by the preceding report. "The main computer is aboard and I’m already withdrawing the security team." She smiled, her eyes springing up to meet his. "Excellent." He beamed back. "I take it you’ve lost contact with our wayward Ensign?" "And Haldo Compz." She nodded. "They must have discarded their comm-badges and the teams can’t locate their bio-signs." "Bring the two insurgence shuttles aboard." He instructed. "And get the other one ready to depart immediately." "It’s already out-rigged with the cloak and the warheads are armed." She replied. "I’ll take care of the rest." "So what do we do?" Katherine asked, flashing a worried glance at the others. "Good question." Blake shrugged, turning to the doctor. "What are you doing here alone?" "I was downloading my notes." He replied, keeping his wide eyes fixed on the cold muzzle of Girlings phaser. "I can’t leave or hide in the bunkers without them, I have too many years of my life invested in them." "This base is over-run." Compz told him flatly. "You’re stuck here with us now and we all need to leave, I take it that you appreciate your predicament?" "I have a gun pointed at me." Dr. Jones told him. "My predicament is foremost on my mind." Blake lowered the weapon and placed it on his belt. He raised his empty hands palm upwards and shrugged. "If you don’t help us get off this rock then you’re dead too." "So now we trust him?" Katherine almost laughed but quickly realised that nobody was in a joking mood. "He works for Section 31." "Not any more." Compz told her grimly. "He works with us or we’re all dead!" "How long have we got?" Blake sat back on a steel desk and lowered his head into his hand as his mind began working over their situation. "What do you mean?" The doctor asked with a shrug. "With the main computer down the deflector shields will fail." He explained. "How long until the other asteroids begin pounding us to pieces?" "Perhaps an hour, maybe two." The Doctor replied sadly, these thoughts never before occurring to him, his mind had been utterly focused on saving his work, not his life. "Backup computers will take care of gravity, life support and everything else until something happens." Compz explained. "Any non-routine event could over-load them and if that happens then systems will begin failing all over the base." "What could be described as non-routine?" Katherine asked hanging her head in dismay and knowing she didn’t really want to know. "Anything that makes the backup computers think." Compz told her showing no signs of his usual optimism. "A shuttle docking, an asteroid hitting the shields, a mouse running into a door…"
"I get the idea." Blake groaned. "We need to leave in a big hurry." Captain Graves sighed heavily and stared out of the huge transparency that separated his guest quarters from the icy vacuum of space. His throat burnt with a reassuring kind of pain that he didn’t even notice as being unpleasant as he took a long shot from his flask of Tarquarian gin. His mind fogged over for a second, his thoughts sent scuttling into the recesses of his mind like cockroaches retreating from a light. He shook his head as if doing so would shake his thought back together. "Love those Tarquarians." He commented, gazing lovingly at his flask and smiling towards his first officer. Commander Winston Morrow reached out for the flask and took a long, welcome blast of the thought numbing liquid. "That stuff will kill you!" He grinned as his mind fell back together like a jigsaw missing most of its parts. "I should be so lucky." Graves shrugged back as the door chime sounded. "What the hell was that?" Winston Morrow cried out, recoiling from the door. "Someone wants to come in!" Captain Graves told him flatly with a note of amusement. "Don’t let them…" Morrow told him fearfully, his eyes as wide as saucers. Captain Graves shook his head knowingly and took the flask back from his friend. "No more for you…" He smiled. "Come in." The door slid open with a hiss as Captain Faruqui stood in the opening, lit brightly from behind. "Mind if I come in?" He asked politely. "It’s your ship!" Captain Graves replied with a shrug. "Perhaps I can offer you a drink." "I have a matter of some urgency I would like to discuss with you." He began, his hands clamping themselves behind his back as he sauntered into the cabin with the door sealing behind him. "Great!" Morrow moaned, his eyes rolling up. "I intend to level with you." Faruqui began, rocking on his heels. "It’s about time." Graves told him sternly, gesturing with his hand for the Captain to take a seat. Captain Faruqui sat down, nodding his gratitude for the offer. He crossed his legs away from the men and sat back thoughtfully. "We are deep within the Neutral zone under cloak at a Section 31 base." He began, instantly grabbing his audiences attention. "We have a ship in orbit hunting for us, a Scarab class attack ship." "Scarab?" Morrow asked, his curiosity outweighing his common sense as often it did. "The fiercest and most powerful ship you can imagine. Armed with weapons that cut through our shields like they’re not there and able to travel faster than warp 9.99 although we have no idea how." He explained. "They’re being built in secret by Section 31, we don’t know where this technology comes from." "I can see why you’re concerned." Graves agreed. "We have captured their base and removed their computers." He continued. "We have remained undetected so far by remaining cloaked and hiding at the edge of the asteroid belt." "But now you have a problem?" Morrow suggested knowingly. "We need to leave in a hurry before we are detected and destroyed and to do so I need your help." Captain Faruqui told them. "You need our help?" Graves asked, sitting up excitedly. "Your friend Haldo Compz is refusing to answer our hails and has gone missing in the base, I need you to bring him back as quickly as possible before it’s too late." "You want us to go over there?" Winston sneered as if the suggestion was tantamount to many unpleasant forms of suicide. "We intend to ferry you over in an insurgence shuttle." He explained. "We have set up pattern enhancers at the appropriate frequencies and can beam you directly back through the shields once you find him." "I don’t know…" Captain Graves replied, rubbing his chin thoughtfully. "Your ship was badly damaged through no fault of your own." Faruqui began with a raised eyebrow. "We have discovered a very large amount of Latinum on the Section 31 installations which would make repairs a very great deal simpler." "You’re going to pay us?" Morrow smiled. "I’m going to buy your silence." He told him flatly. "You’ve done what you set out to do, you’ve hurt Section 31 more than anyone else ever has. Now I’m going to pay you enough to ensure you never have to trade again. You can go where you want and do what you want. Section 31 will never find out about your involvement unless they hear it from you so you’ll be safe." "And if we refuse?" Captain Graves sat back, clamping his hands behind his head. "I’ll continue trying to raise him as best I can but if I detect the presence of a ship I’ll have to leave Compz behind to die." Captain Faruqui replied leaving no question of his sincerity. "I can’t take on a Scarab and can’t risk the entire ship and crew in a vein attempt to do so." "What is this place for?" Blake asked, looking up from his ruminations. "This installation?" Dr. Jones asked. "It’s a lab, we test things, new technology." "Blake," Katherine began, "we need to leave now!" "There’s no conventional way to leave." Compz reminded her. "We need to ascertain what options are available to us." "Are there any shuttles?" Katherine asked hopefully. "No." The doctor replied with a shrug. "We’re re-supplied by passing ships, they have to remain cloaked to operate here and shuttles are usually too small to carry an effective cloak." "There’s nowhere to beam us to…" Blake added redundantly. "It seems we’re trapped here." "If Section 31 run true to form then they’ll destroy this base now that it has been uncovered." Compz added thoughtfully. "They won’t care about their own personnel, in fact they would probably assume them already dead." "This is great." Katherine huffed in her frustration. "I can’t believe we’ve come this far to get stuck here now…"
"Are there any ships here?" Blake snapped up hopefully. "Yes…" The doctor replied, a little taken back with Girlings sudden surge of enthusiasm. "We have a large hangar bay with all the captured vessels we were reverse-engineering. That’s what we do here." "Reverse-engineering?" Katherine screwed up her face curiously. "They capture vessels and copy the technology." Compz told her. "It’s quicker than doing the job properly yourself." "That’s where most technology comes from." Jones replied haughtily. "Federation technology didn’t all grow from the invention of warp-drive, most of what we take for granted has been usurped from other races by people like me." "And what sort of person would that be?" Compz leaned forward showing the first signs of aggression in his long memory. "Meaning..?" The doctor stammered nervously. "You should choose your words more carefully around these two." Katherine told him gravely. "They have more reason than most to disapprove of your methods." "Who are you?" He glanced from face to face of the two men in front of him who were glaring with barely concealed menace. "I’m a Moronian!" Compz told him, gritting his teeth. "Men like you genetically engineered me and then wiped out my whole race." "Moronian?" The doctor smiled nervously. "I’ve heard of you." "I’m gratified that our reputation at least has outlived my kind." He growled. "You weren’t wiped out…" He stammered, highly unsure of his ground as he flashed glances from face to face. "I’ve heard stories." "What sort of stories?" Blake scowled at him. "Moronians aren’t really a race." He began, backing gently away from the large and menacing figure. "They’re just Humans who were infused with DNA of other species to enhance their basic abilities." "You’re Human?" Katherine smiled at him. "I would never have guessed." "That’s even more reason not to have killed us." Compz grumbled as the new information churned away inside him. "The Mornoia colony was destroyed." Jones continued. "As far as I know everyone was relocated first." "What?" Compz turned on him again, his black eyes glowing with almost perceivable anger. "We wouldn’t kill that many people." Dr. Jones shrugged. "We’re trying to protect the Federation, not destroy it. We use unusual methods but we don’t resort to genocide." "You know this for a fact?" Compz spat the words at him, demanding a reply. "To be fair, do you know for a fact that your people were destroyed?" Blake asked. "Let’s just concentrate on getting out of here." Compz grumbled. White light spilled into space from the invisible ship as the shuttle-bay door yawned open allowing the cumbersome form of the insurgence shuttle to drift out showing only a minor distortion of the light bent around it. Captain Graves huffed to himself as he paced up and down the lounge at the rear of the little combat ship. "I can’t believe we’re doing this." Commander Morrow grumbled. "I know." He agreed leaning up against the bulkhead to stare out of the lozenge shaped window. "It seemed like a good idea at the time." "I was fine with it until I actually saw the shuttle." Morrow agreed. "I know." Graves replied with a shudder. "Did you see the size of those pulse-phasers on the side?" "You couldn’t miss them!" Morrow nodded enthusiastically. "No wonder the Wanderer never stood a chance!" "And that big thing mounted on top?" Graves continued, turning to face his friend. "I guess that was the cloaking device." Morrow shrugged. 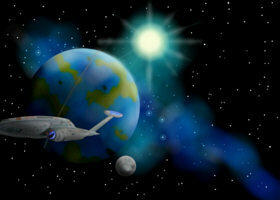 "Oh god…" Captain Graves gasped as the blackness of space vanished to give way to the sight of a seamless wall of rock. "I think we’re in the tunnel now." "We’ll be docking in a few seconds then!" "Fantastic." Graves added sarcastically. "Lets head down to the control room, get some weapons and get out there and find Compz. The sooner we do the sooner we’ll be out of here." "Agreed." Morrow replied with clear reservation. "Can you use a tricorder to boost the gain on a comm badge?" Girling suggested as the four moved out of the office. "We could monitor comm traffic, find out what the Violator is up to and I’d definitely be interested to know if any troops wake up." "I can do that." Compz nodded, his fingers instantly began dancing across the controls. "Do you think he’s ok?" Katherine whispered to Blake. "I’m sure he could do with some time to think." He replied. "When we get out of here he’ll probably realise that it’s good news." "Now do you see what kind of man you are?" Katherine asked, turning to the disgruntled doctor who had been made to walk in the middle of the group. "Your methods hurt people." "I’ve got a lot more questions for you yet." Blake told him. "No problem." He replied haughtily like a scolded child. "I’m a scientist, not a soldier. My job is to answer questions and shed light on ignorance. Ask away." "How many ships are in this hangar?" Katherine began. "Is anything there actually useful?" "There are lots of ships." He shrugged. "Most don’t work any more." "We need to run a blockade." Blake sighed. "We’re expecting to meet heavy resistance so something with a working cloaking device would be ideal." "I have the original Romulan prototype of the Bird-of-prey." The doctor smiled happily. "The one the Klingons stole to build the B’rel from." "The Klingons stole the B’rel?" Compz looked up with sudden interest. "It’s not widely known but not a proper secret." Katherine added. "Is it much different?" Blake asked. "It’s a lot cleaner." Jones smiled. "There are small nacelles on the wingtips where the Klingons fitted guns on their version. Originally the wings moved down to open the radiators and bring the nacelles into position for warp, the Klingons fitted their warp coils at the rear but left the moving mechanism in because they thought it looked good." "Typical Klingon engineering." Katherine nodded. "Does it work?" Blake asked, dragging the conversation back to more pressing matters. "The cloak does but the warp drive is inactive and it doesn’t have any weapons." Jones replied with a sorry expression. "Maybe you could get out and push?" Compz suggested dryly. The insurgence shuttle jerked slightly as the hull married up to the airlock doors. "We’re parked." Captain Graves swallowed an imaginary lump in his throat as he continued down the narrow interconnecting tunnel to the cockpit. "I guess so." Morrow agreed with a sigh. Graves stepped down the two metallic steps to the cockpit just in time to see the two flight engineers vanishing in a haze of sparkling blue light. "They’ve beamed off!" Captain Graves called out with a rising tide of panic beginning to uncoil itself in the pit of his stomach. "Why would they do that?" Morrow shrugged. "It doesn’t make any sense…"
"No." He agreed angrily. "It doesn’t." Captain Graves pushed past his friend and ran back into the tunnel that led to the lounge and stopped at the small doors that allowed access to the central cargo pod. "This isn’t a weapons pod!" He called back to Morrow as he peered inside. "These insurgence shuttles are meant to have a central pod with twin racks of photon torpedoes on board." The Captain explained. "There are no racks here." "I don’t like this…" Winston moaned wearily as he stood behind his captain and peered into the pod. "There are two tubes." He began as he stepped gingerly into the cargo bay. "I heard they found something like these on the other base." "There’s a rack of torpedoes on the other side!" Morrow called out from the corridor. Graves sighed with a small dose of relief that his fears may be unfounded. He knelt down and gazed into the dark glass set into the door of the tubes. "Are there any lights flashing on the torpedoes?" Graves snapped, jumping up with a renewed sense of dread. "Yes." Morrow replied. "Red light flashing at the fronts." "Oh no…" Graves moaned, hanging his head into his hands as a surge of acid exploded in his belly and sweat began to prickle uncomfortably down his spine. "What does that mean?" Morrow asked, his head appearing in the tiny doorway. "It means they’re armed." Graves sighed hopelessly. "They normally don’t arm until they lock onto a target." "So they’re ready to explode?" Winston gasped. "Any impact or shock will set them off." He agreed, slumping back to perch on the tip of the tube. "They’re going to kill us?" Morrows eyebrows traced upwards as the horror took hold of him. "I imagine the warp core is set to overload." He nodded. "With the warheads as well there’s plenty of anti-matter to destroy this entire base, us included." "What can we do?" Morrow shrieked, his voice escalating in volume and tone. "Find Compz!" He grinned with a renewed hope. "He might already be dead." Morrow cried out. "Why would they bother?" Graves jumped up to the cargo door and dragged himself through. "Why kill him when you can just leave him behind to die with the rest of us..?" "How far is this hangar?" Katherine moaned as the dingy rock tunnels seemed to drag on forever. "It’s not far." Jones assured her. "May I ask a question?" "I guess so." Blake acceeded grudgingly. "What do you expect to have to get past?" He asked. "There are a number of serviceable vessels but it depends what opposition you’re expecting to encounter." "The Romulans for a start!" Blake told him moodily. 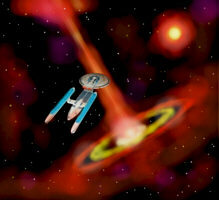 "And the Starfleet intelligence vessel, Violator who might have brought in even more ships by now. Added to that we think there’s a Scarab looking for us too." "We’ve had a busy few days." Compz quipped. "A whirlwind of fun, parties and making friends with everyone we meet." "There’s nothing here that will get past a Scarab." Dr. Jones smirked, glancing at their annoyed expressions as if he thought they were joking. "They have the best sensors in the galaxy, nothing gets past them." "Is there one out there?" Blake hissed coldly. "The Ibex." Jones nodded. "She’s still in orbit." "So all bets are off!" Compz raised the part of his forehead where his eyebrows weren’t. "I haven’t given up yet." Blake assured him with unrealistic resolve. "The Romulans won’t give us any trouble." Dr. Jones added as they continued. "How comes?" Katherine asked hopefully. "They work with us, they know we’re out here." "The Romulans work with you?" Blake repeated in surprise. "Of course." Jones replied as if the suggestion was ridiculous. "The greatest threat to the Federation in this quadrant is everyone but the Romulans and they feel the same way about us. The Klingons could turn on us at any time and would if they thought they’d win. The Borg are a huge threat and then there’s the Ferengi and the Dominion allies are still a significant danger if they ever wanted to be." "So you work with the Romulans?" Katherine shook her head in disbelief. "Not publicly." Jones replied, raising his palms as if this was all just common sense. "We just have an agreement with them." "We still have to get past the Ibex…" Compz reminded them. "What could do it?" Blake stopped suddenly in his tracks and turned on the scientist. "Nothing." He shook his head. "They won’t fire on me anyway, I helped to design it." "I wouldn’t bank on that." Katherine assured him. "Section 31 has a habit of tying up loose ends." "They still need me to design her successor." He said hopefully with a tone that implied he was growing increasingly unsure. "Plenty of good men like you." She smiled thinly, slapping him on the arm. "The next one has come before but we weren’t ready." He replied dismissively. "They need me to realise the vision!" "I’m picking something up." Compz said with some surprise. "It’s a very faint signal but someone on this base is hailing us." "See what you can do to boost the signal." Blake told him. "I hadn’t thought of that." He grumbled sarcastically. "This is Captain Graves to Haldo Compz." He repeated. "This isn’t going to work." Morrow grumbled pathetically. "We know that the Violator has to slink off at thruster power with shields down." Graves insisted. "If it goes to impulse or warp the Scarab might detect her and pursue. At that speed it’s going to be a while for her to get safely out of range." "But we don’t know where Compz is!" He moaned. "We only need stop the warp core overload and then we can get the hell out of here on the insurgence shuttle." Graves replied forcefully. "This is Haldo Compz." A weak reply issued from the Captains comm badge evoking a great deal of jubilation. "This is Graves." He began excitedly. 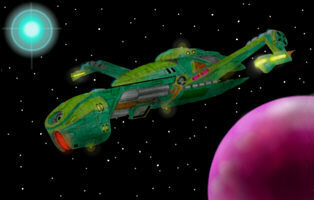 "Faruqui has rigged a shuttle to explode with enough warheads to blow us all away. We don’t have long. Can you get to the main docks in time to help us defuse it?" "On my way." He replied. "Compz out." "Looks like we have more things to worry about." Compz smiled. "Just as things were getting dull." "It’s been quite a day." Katherine sighed. "We have to get to the main docking area." Compz turned to the scientist. "My friends from the Wanderer need our help to defuse a bomb that will kill us all so we need to get there by the fastest means possible." "Transporters require the main computer." He shrugged. "There’s a tunnel that will get us there in about three minutes." "Compz to Graves." He began as he pressed on his communicator. "On our way, sit tight." "The Wanderer?" Doctor Jones raised his eyebrows curiously. "My old ship!" Compz nodded in his general direction, still not keen on talking with him. "I’ve heard of it." The doctor began as all three stopped suddenly and turned to give him their full attention. "We have its crew here." "How do you have the crew?" Katherine asked. "They ejected the escape pods as we were attacked." Compz explained. "How did you get hold of them?" "I don’t know." The doctor shrugged. "I imagine there was a cloaked ship that tractored them in." "They’re prisoners here?" Blake asked, frowning in disapproval. "Not exactly…" He began nervously. "They were delivered to me for as raw materials for my experiments." "What did you do to them?" Compz sneered, stepping forwards with his fist balling angrily, ready to attack at the slightest provocation." "Nothing!" He assured him quickly, his hands raised in surrender. "They were being prepared but nothing had been started." "What did you intend to do to them?" Blake asked, manoeuvring himself between Compz and the slightly built scientist before he took it upon himself to slightly unbuild him. "It’s… difficult to explain." Jones stammered nervously. "We have this procedure that we designed." "Does it involve putting people in tubes?" Katherine asked, dreading his answer. "Yes." He replied in surprise. "How did you know?"